These 100 acres along the Fort Point Channel will be regularly inundated with water by 2100, owing to predictions of more frequent, severe storm surges together with a 5’ sea level rise in Boston Harbor. 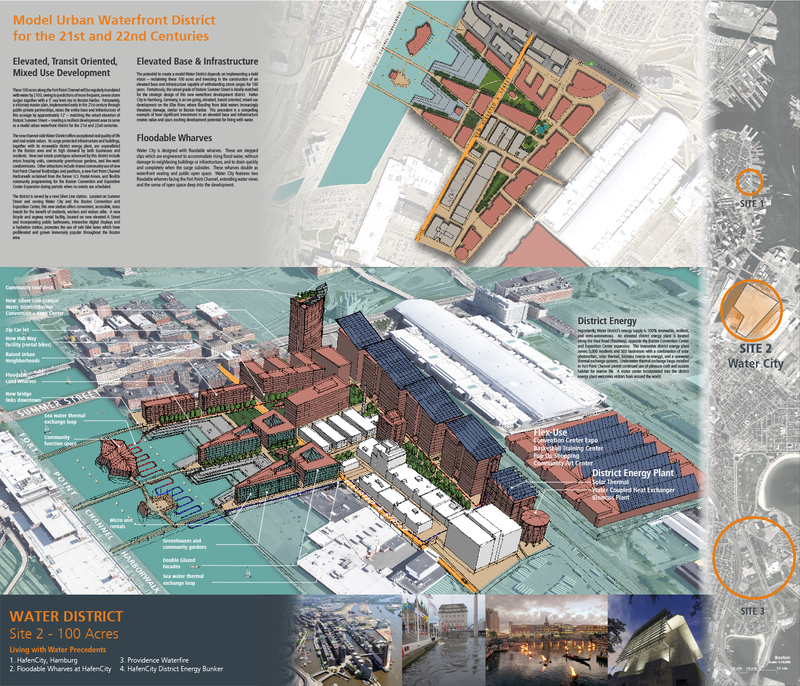 Fortunately, a visionary master plan, implemented early in the 21st century through public-private partnerships, raises the entire base and infrastructure of this acreage by approximately 12’ – matching the raised elevation of historic Summer Street – creating a resilient development area to serve as a model urban waterfront district for the 21st and 22nd centuries. The new channel-side Water District offers exceptional real quality of life and real estate values. Its surge protected infrastructure and buildings, together with its renewable district energy plant, are unparalleled in the Boston area and in high demand by both businesses and residents. New real estate prototypes advanced by this district include micro housing units, community greenhouse gardens, and live-work condominiums. Other attractions include shared community use of new Fort Point Channel footbridges and pavilions, a new Fort Point Channel Harborwalk reclaimed from the former U.S. Postal Annex, and flexible community programming for the Boston Convention and Exposition Center Expansion during periods when no events are scheduled. The district is served by a new Silver Line station. Located on Summer Street and serving Water City and the Boston Convention and Exposition Center, this new station offers convenient, accessible, mass transit for the benefit of residents, workers and visitors alike. A new bicycle and segway rental facility, located on new elevated A Street and incorporating public bathrooms, interactive digital displays and a hydration station, promotes the use of safe bike lanes which have proliferated and grown immensely popular throughout the Boston area. Importantly, Water District’s energy supply is 100% renewable, resilient, and semi-autonomous. An elevated district energy plant is located along the Haul Road (floodway), opposite the Boston Convention Center and Exposition Center expansion. This innovative district energy plant serves 5,000 residents and 500 businesses with a combination of solar photovoltaic, solar thermal, biomass (waste-to-energy), and a seawater thermal exchange systems. Underwater thermal exchange loops installed in Fort Point Channel permit continued use of pleasure craft and sustain habitat for marine life. A visitor center incorporated into the district energy plant welcomes visitors from around the world. The potential to create a model Water District depends on implementing a bold vision – reclaiming these 100 acres and investing in the construction of an elevated base and infrastructure capable of withstanding storm surges for 100 years. Fortuitously, the raised grade of historic Summer Street is ideally matched for the strategic design of this new waterfront development district. Hafen City in Hamburg, Germany, is an on-going, elevated, transit oriented, mixed use development on the Elbe River, where flooding from tidal waters increasingly threatens damage, similar to Boston Harbor. This precedent is a compelling example of how significant investment in an elevated base and infrastructure creates value and spurs exciting development potential for living with water.